'Rammed Earth' is usually a technique used for building homes, but Israeli designer Adital Ela has extended its use to create something else. These Terra Stools are made from earth and natural fibers in a unique compression process that was re-developed as part of a longterm study of materials and ancient building methods. Ela is the project's designer-gatherer, and gathers all materials from construction and agricultural waste and from the natural environment. The result is a stunning and unique looking series of artifacts, furniture and more. The objects are mainly made of earth, but Ela also makes use of her own home made compost, therefore making the products 100% degradable – just break them and throw in the garden to enrich soil. 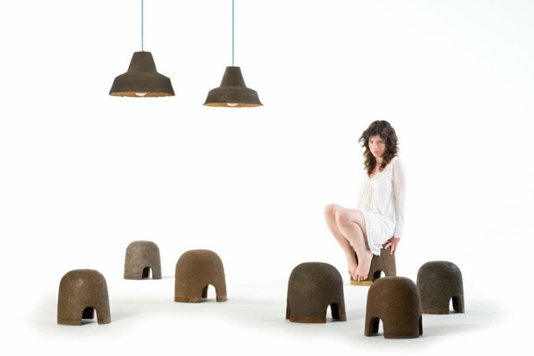 The stools, cups, lampshades and other pieces of furniture are made by blending organic matter like plants, soil and various fibers, molded and compressed by her feet. According to Ela's research, the foot-mixing technique for earth-based construction is quite old, being used in ancient times in places like Iran, Iraq and Palestine. There are interesting implications in Ela's project - not only are these materials available everywhere, the time-honored technique is something that anyone can use to create their own low-impact and easily recyclable furniture. In developing her methods, Ela realized that her own grandmother built ovens in the past using similar techniques: “I was amazed to discover that this knowledge was actually in my family one generation away. It reminded me again how crucial it is to find ways to lean back onto the heritage taught to us by our ancestors and take it forward by applying current scientific and technological knowledge, towards a future in which also our products have grandchildren”.